Ann is a Certified Canine Fitness Trainer (CCFT) who is passionate about enhancing the well-being of dogs and their people. 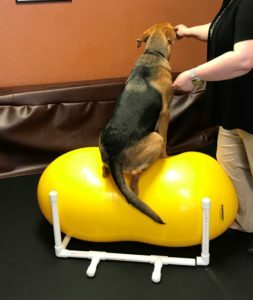 As a CCFT, she was trained through the University of Tennessee School of Veterinary Medicine in canine assessment, body mechanics, anatomy, functional movement, behavior, nutrition, and injury prevention and care. She is currently the only CCFT between Portland, Oregon, and Seattle, Washington. Ann is also licensed as a clinical social worker and has a a certificate as a Canine Conditioning Coach. For more than three decades, Ann has worked beside and trained dogs in a variety of ways. In 1987, understanding the profound impact animals can have on our lives, she began integrating dogs into her human counseling practice. In 1990, she founded an animal-assisted activities and therapy program at a local hospital and was the national Director of Animal-Assisted Therapy Services at Pet Partners (formerly Delta Society®) from 1995-2000. 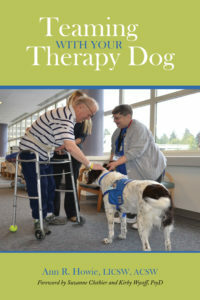 She is the author of three books about various aspects of animal-assisted interactions. Her most-recent, Teaming with Your Therapy Dog, is being used as a text by many therapy-dog groups and trainers nationwide. In 2018 she was named Director of the University of Denver’s Canine-Assisted Intervention Specialist program. In 2001, Ann began training dogs professionally using positive-reinforcement methods to shape behavior and help her clients meet their training goals. 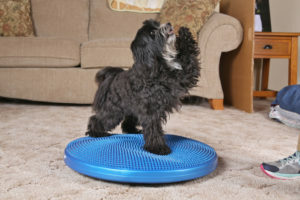 A member in good standing with the Association of Professional Dog Trainers (APDT), she regularly participates in continuing education to stay up-to-date on training theories and techniques. Ann’s career focus shifted to canine wellness in 2017 after seeing the positive change fitness training had on her own dog, Gusto. Not only did his body condition improve, he was having the time of his life overcoming challenges and learning new things. And Ann was having fun, too, spending time with her dog and learning that he was capable of more than she ever dreamed. It was then that she knew she wanted to bring this same type of mental stimulation, physical conditioning, and plain old fun to other dogs and their people. 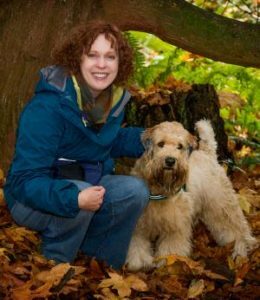 In her work with Dogs in Action, Ann focuses on compassionate and respectful handling of your dog’s needs, creating a customized fitness plan that accommodates his/her physical limitations and condition. Because of her broad background and training, Ann is skilled with dogs of all shapes, sizes, and temperaments, and with people of diverse backgrounds and cultures. Her sense of humor and calm, reassuring demeanor put both dogs and humans at ease. At every step along the journey, she is there offering guidance, support, and encouragement to her clients and their dogs, helping them live healthier, happier lives together.